When you start exploring OBEs, it's natural to be afraid: afraid of the unknown, afraid of death, of getting lost, possession, monsters, demons and spirits. Your best defense (or, if you're British, defence) is to not be afraid. 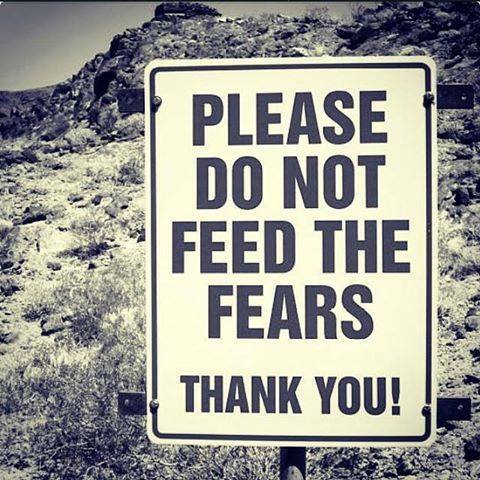 And the ideal way to do that is to confront your fears directly. The following is is a true story about me confronting my fears. This is a somewhat longer (and lightly edited) version of an article that was published in the Lake Country Journal magazine a few years ago. As I drove to Garrison, Minnesota, my wife, Kathy, told me the unusual circumstances. A man had been transporting a bear and stopped at Dairy Queen (DQ) for a quick bite to eat. After lunch, he had driven away, unaware that the bear chewed through its cage, climbed out the window of the trailer, and escaped. The next day, the authorities located the bear's owner and arranged transport. It had made a mess in the cage, so Deb called volunteers for help, and naturally they called Kathy. Kathy volunteered me! As we walked toward the building, my mind flooded with bad memories. All my life I'd had nightmares about bears. Night after night they chased me through the woods in my sleep. They got worse in 1986 when my friend Cindy told me how her best friend had been mauled to death in her sleep, unprovoked, by a grizzly at Yellowstone. Now I was about to meet one of these monsters face to face. I asked Kathy “Are you sure about this?” She reassured me. “Deb said it's just a cub, and it's used to people.” I was skeptical. “How old is this so-called cub?” She said, “Ten months.” Great, I grumbled to myself. An adult grizzly weighs 800 pounds. How big is a ten-month old? I was nervous as we went inside. I remembered a meme on Facebook, a national park sign that read, “Please don't feed the Fears.” I repeated to myself, It's only a cub. It's only a cub. “I'll take photos,” I said to Kathy, who took the bag from me, fearless. 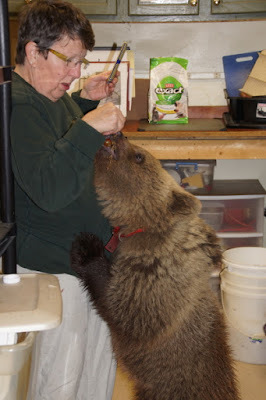 I was filled with dread when the vet slid open the heavy steel door, and the bear stepped out into the hallway. It was four feet long, 150 pounds: quite a cub! Its fierce claws were long and sharp. They were also bloody, as if it had just mauled its latest victim. Showing her tender love for animals, Deb the vet said, “The poor thing. 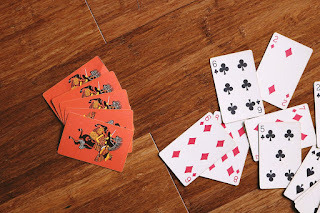 It's so desperate to get out, it hurt its paws.” Then she grabbed cleaning supplies and slipped inside the cage, leaving the three of us to entertain the bear. I was grateful when the grizzly lumbered over to Marilyn first, leaving bloody paw prints as it walked. Timid, the poor woman quickly plucked an apple from her bag and pressed it toward the beast. The huge brown head opened its white fanged mouth and snapped. Marilyn yanked her hand back, dropping the apple. The bear snatched it from the floor and smashed it like a twig with one blow of its crushing jaws. Then it looked up, demanding more. She gave it more apples, but the bear became more insistent, inching ever closer. She tried to back away, but soon the bear was up on its hind legs, nearly climbing up her torso. When Kathy saw Marilyn's distress, she lured the bear away with an apple. I heard another crunch as the apple exploded with a single bite. Kathy snapped her hand back and counted: All five fingers present and accounted for, but next time she'd be more careful! 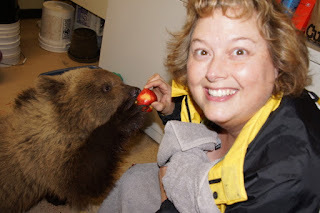 Kathy fed the grizzly a couple more apples, but I wanted a photo. I said, "Turn and smile!" She turned and gave me a panic-stricken smile that said, What are you, crazy? 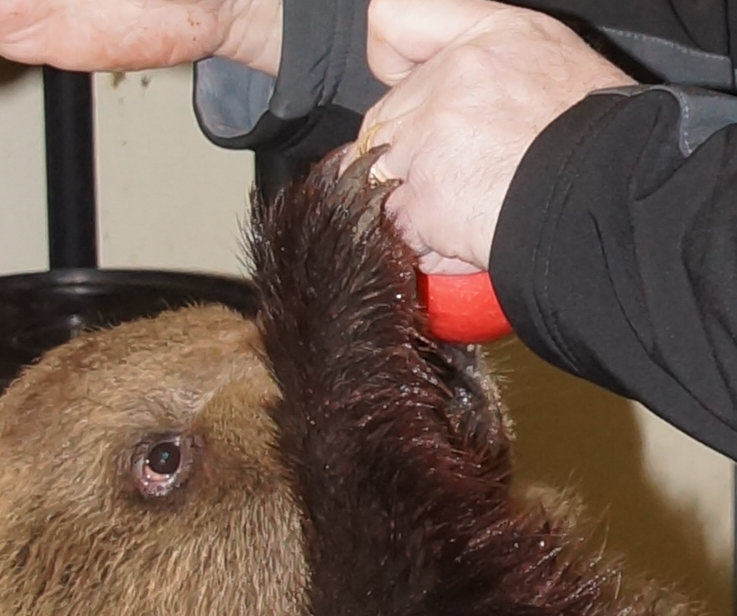 You want me to look away while my fingers are inches away from a grizzly bear's mouth? After a few more apples, Kathy turned to me and said, “Your turn.” She took the camera and left me holding the bag. I pulled a bunch of grapes from the bag and held it toward the bear. It wolfed them down greedily and came back for more. I reached in and brought out an apple. With a thrust of its head, it brushed the apple aside and it fell to the floor. I tried another: same thing. Its mouth was open, hungry, but now it was tired of apples! Alarmed, I pushed apples aside until I found my last bunch of grapes, then put it into the grizzly's mouth. It snapped it down, then chased down the grapes that had rolled away. It smacked its lips and came back toward me. Standing on its hind legs again, it put both its blood-soaked front paws on me. Its sharp claws dug into my hand and it seemed to be demanding, in William Buhlman fashion: Grapes. Now! The bear and I were locked in an uncomfortable tango as my lifelong nightmares returned. I retreated as he advanced, toothy mouth open. Then I looked in his eyes and it suddenly occurred to me: this is not the face of evil at all. I was dancing with a land-shark, a biological eating machine. And I had lost my only means of control. Kathy disappeared down the hall. Then, an eternity of seconds later, reappeared with a bowl of dog food. She waved it in front of the bear, who got down and followed her into the cage. Soon Deb and Kathy came out and slid the door shut. My heart was pounding. I looked at Kathy. “I just hand-fed an uncaged grizzly bear with Marilyn Monroe. Do you know how crazy that sounds? Nobody's going to believe that.” She said, “Truth is stranger than fiction. Plus, you have proof,” she said, holding up the camera. As we left the building and walked to our car, I heard a lonely wail from inside the building and it tore at my heart. As I drove home, I reflected on what had happened. Somehow, after my surreal dance with the grizzly, my fear had been replaced by love, awe, and pity. I felt sorry for the cub. The poor guy was alone again, caged, condemned a slave for the rest of his life, subjugated to keepers and gawkers when it should be out in the woods. Unlike Deb's other patients, it would never be wild and free. And I had been complicit. I felt ashamed to be a human. Still, I was grateful for the encounter.